Woven Knotted Bow Headband Pattern with SVG Cut Files for Cricut Maker - Coral + Co. I don’t know if you can tell, but I can’t get enough of these knotted bow headbands so when Cricut came out with the new Cricut Maker, I KNEW that this would be the PERFECT pattern for it. So I sat down and designed a Woven Knotted Bow Headband Pattern with svg cut files for the Cricut Maker. Ok, confession. I have had this post halfway done for several months. Actually it was pretty much all done except for the pictures showing the finished look. I really meant to have this fun little pattern out to you all but thanks to my friend #GoAwayIrma Hurricane Irma, which I wrote about here, we had a little bit of delay in just about everything blog related. But the good news is I’m soooo back and ready to pile on the patterns and tutorials for y’all! My previous Knot Bow Headband Pattern is made with knit fabric with is great, its super stretchy and comfy, but there are SO many more fabric options with woven fabric. So I decided that a Woven Knotted Bow Headband Pattern would be a great addition, because who doesn’t need options??? Amiright?! I also decided that this was the perfect occasion to snap some picks of my toothless girl. Love that smile! 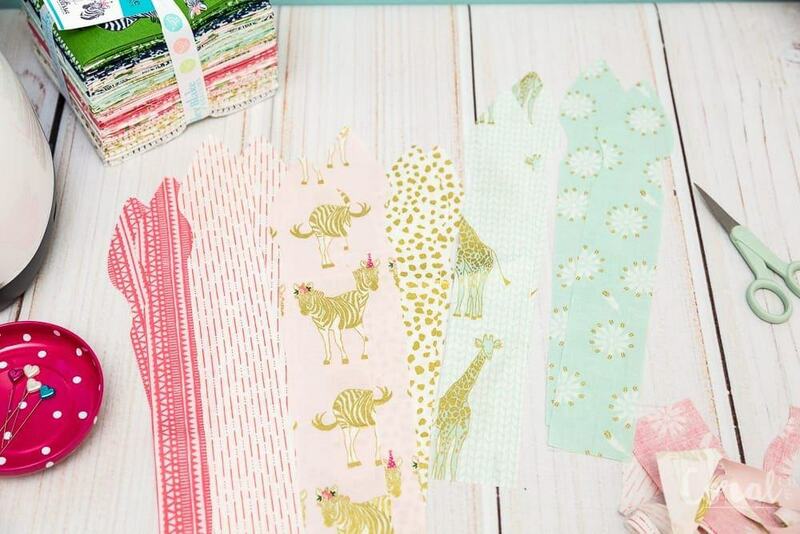 I had a fat quarter bundle of this gorgeous Safari Party Fabric line designed by Melissa Mortenson from The Polkadot Chair for Riley Blake Designs (you can see my Charm Square Quilt Tutorial made with this fabric as well) that I was just itching to make more things with. I’m totally a sucker for all the pinks, blues, and golds, plus who doesn’t love zebras? My kiddos most definitely do! 1-2 fat quarters Safari Party Fabric depending if you want it to be reversible or not. You can find the full fat quarter bundle here. Step 1. Load the Knotted Bow Headband Pattern SVG File into the Cricut Design Space Software. You can see more detailed instructions in this tutorial. Step 2. Duplicate either the Knotted Bow Headband either 1 time or 3 times depending on how many you are going to cut from each fabric piece. 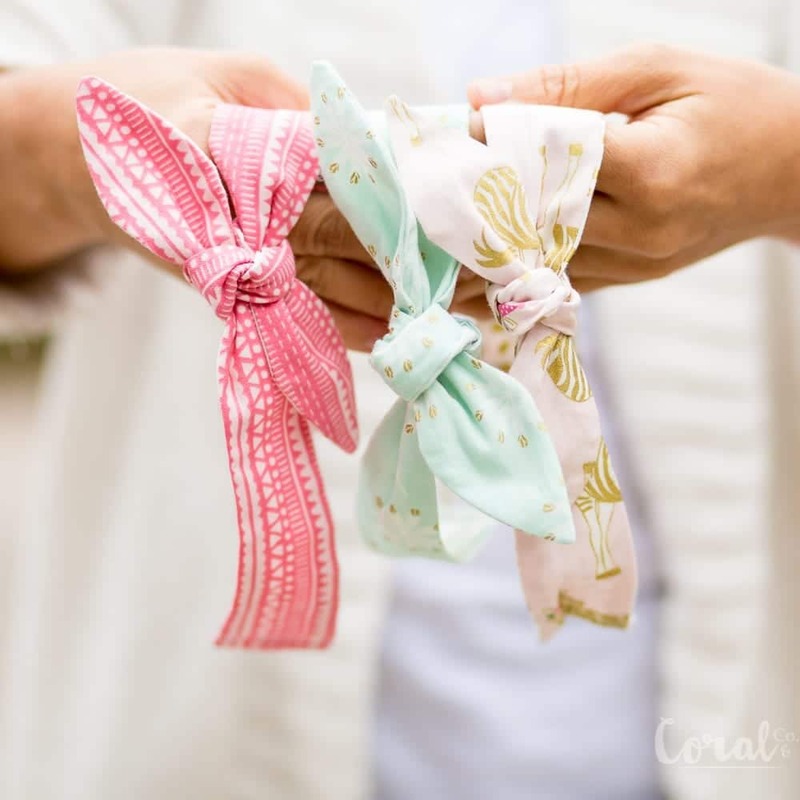 ***For example – if the headband is going to be all the same fabric you will need to duplicate it 3 time so you have a total of 4 headbands showing like below. If you are going to make it reversible you will need to only duplicate it 1 time and repeat the whole process a second time with your second cut of fabric. Step 3. Once you have either 2 or 4 headbands lined up in design space you will click MAKE IT in the lower right hand corner. 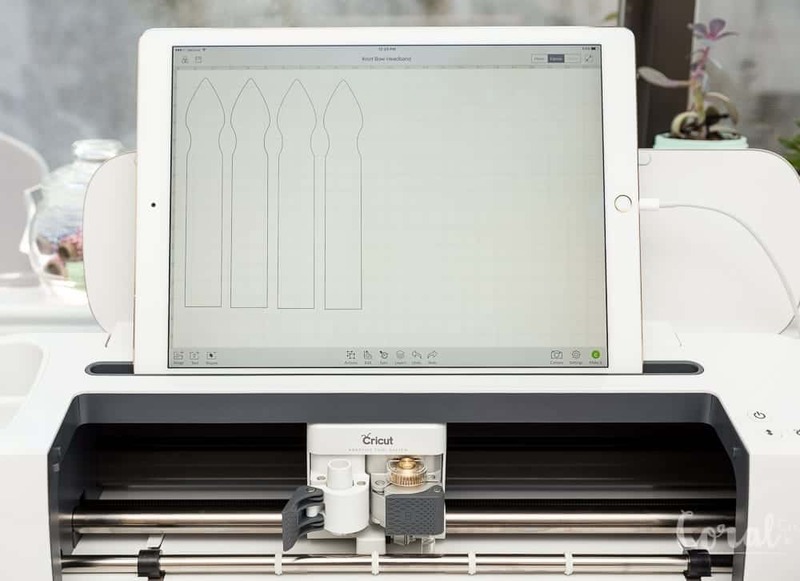 *** Tip – I used my ipad to connect to the Cricut Maker using the Cricut Ipad App. I was far easier than lugging the Maker to my computer is probably one of my favorite features (besides cutting fabric – duh!) of the Cricut Maker. Step 4. Place your cutting mat with you piece of fabric pressed firmly on it into the cutting mat tray. Step 5. This step will tell you it is sorting the projects int mats by color (or cuts for the same fabric). When it says *At least one of your images is larger than 11.5″ in height or width. Please click Ok to continue with a larger mat or click Cancel to go back to the canvas to reduce the size. Click Continue. This is okay because you are using a longer mat. You will need a larger mat (12×24 inch mat) for the larger sizes of the knot bow pattern. Step 6. Choose the correct fabric type. For this project you will choose medium weight cotton. Step 7. 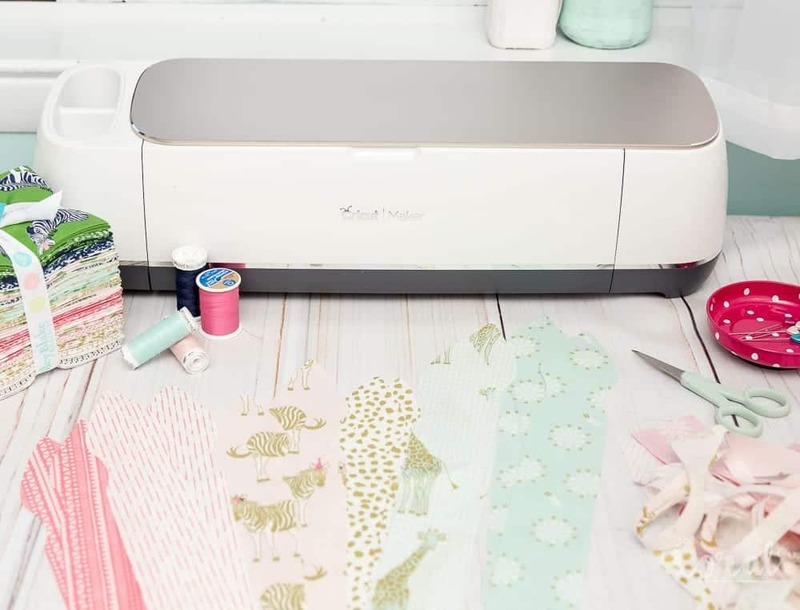 Cricut Design Space will check for and confirm that you have the rotary blade installed in order to cut the fabric. Step 8. Cut the Knotted Bow Headband Pattern with Cricut Maker. Peel off surrounding fabric. Then carefully remove the knotted bow headband pattern piece. You will now have 4 Knotted Bow Headband Pattern pieces to make one knotted bow headband. Step 9. Cut a 3 – 4 inch strip of 1/4 inch elastic. Step 1. Place both Knot Bow Headband Pattern pieces right sides together (RST). Pin to hold together. Step 2. Starting at one side of the short end of the Knot Bow Headband Pattern piece sew a straight stitch 1/4in from the raw edge, going all the way around the headband, stopping at the opposite side. Trim the point at the top to reduce bulk when turned. Step 3. Turn Knotted Bow Headband pattern pieces right sides out. Tip – *If you are having trouble you can use a pencil to help push it through. Step 4. Fold raw fabric edges under 1/4in and press. Step 5. Sandwich 1/4in ends of elastic into the folded under raw edges of the knotted bow headband pattern pieces. Step 6. Sew a straight stitch 1/4 – 1/8in from the folded under edge down the short side of the Knotted Bow Headband. You are all done! And now have some adorable headbands for your cutest girl! You can find all the Knotted Bow Headband Patterns by size below. Step 1. Load the Knotted Bow Headband Pattern SVG File into the Cricut Design Software. You can see more detailed instructions in this tutorial. *** Tip – I used my ipad to connect to the Cricut Maker. I was far easier than lugging the Maker to my computer is probably one of my favorite features (besides cutting fabric – duh!) of the Cricut Maker. Step 9 Cut a 3 to 4 inch strip of 1/4in elastic (3 inches for smaller sizes 4 inches for larger sizes). 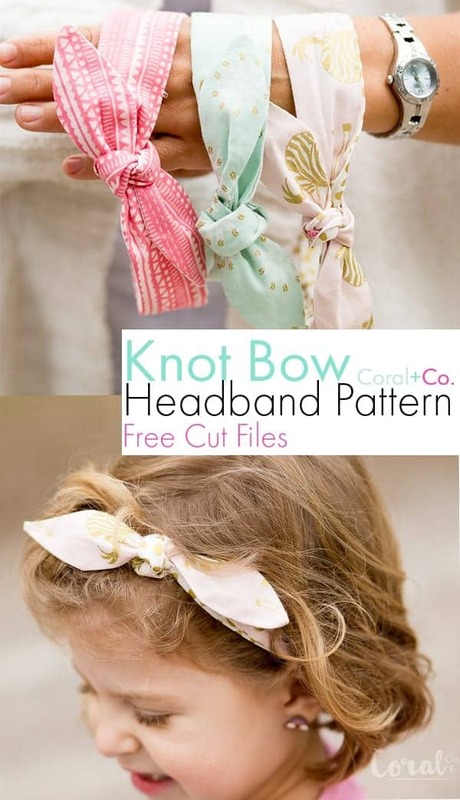 Pin the Knotted Bow Headband Pattern with Free Cut Files for later! These are adorable my little girl is going to look so cute in them! Thank you for sharing! Thank you so much for the Knotted head band and svg files. Do you know if there is another way to download the files without having to sign up for the free trial of droplets? You don’t need to download droplr, just hit the download button in the upper right corner. Sorry, there is no other way for me to host SVG files on my site. Thank you so much. I’ll give that a try. I find the answer to my question ! Thanks ! I can’t wait to make this pattern for my girl, but she’s older. I found the pattern for the babies-2T size but I’d like to make the bigger sizes. Where can I find the pattern pieces for bigger sizes if I don’t have a Cricut Maker?